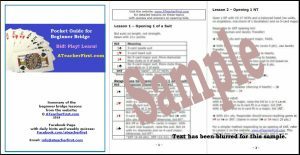 If you found the lessons in Steps 1 and 2 to be clear, concise and easy to understand, then you may also find this Pocket Guide for Beginner Bridge to be helpful as well. It has been created specifically to give a compact and brief summary of the 10 beginner lessons in a handy booklet. Initially, I prepared a similar booklet as a quick reference guide to help my beginner groups. They were very appreciative and thankful for it, carrying it with them when they played bridge so they could check their bidding from time to time. They have told me that it helped to build their knowledge and confidence in bidding while they were learning. Just like training wheels on a bicycle, eventually they did not need it anymore, though they often still bring it with them, just in case. The original booklet has been updated and improved over time. The 2019 version has a new cover and a few new hints, though not much different from the last year or so. Good rules apply indefinitely! I have had many requests for it from beginner bridge players who find my lessons helpful and from bridge teachers, too. Most of the comments on the sidebar are from website visitors who have purchased the Pocket Guide. Once ordered, you will receive the Pocket Guide by email as a PDF attachment. It is not sent as a printed document. You can print as many copies for your group as you need. If you share it with more than 10 players, perhaps you or someone else could make another purchase of it for $10. Unlike many pocket guides, this one can be easily copied. The folded dimensions are 8 1/2″ tall by 5 1/2″ wide. This booklet is set up to be printed on four 8 1/2″ by 11″ sheets of paper in landscape format. Once printed, it can be folded easily and assembled into an 8-page booklet. Once payment is received, the Pocket Guide will be sent to you by email usually within 24 hours. If, for any reason you do not receive it in a day or so, please send me an email (info@ateacherfirst.com) and tell me that you have not received it. Before you do that, please check your Junk email or Spam folder, just in case it landed there which does happen sometimes. I usually check my email at least twice each day. Rarely, I am away from my computer for a bit longer than that, and sometimes I am traveling and not able to use Wifi for a day or two, but that does not happen often. You will receive the booklet as soon as I can send it. If you would like more information, with no obligation, please send me an email — info@ateacherfirst.com. Your purchase also helps to pay some of the expenses of maintaining this website — thank you for your support! I have also used the placemats with my beginner groups. The Pocket Guide is useful as a reference book once beginners have studied the lessons, but the placemats are for real beginners — when they need help to get started. The placemats are right there, on the table, as a quick and easy reference. My recommendation is to use the placemats when first learning if all players are new to the game, but don’t use them for too long. The placemats can be a good idea for a new player who is joining a more experienced group, so the “rookie” can find his/her bid quickly and move the game along, if that is okay with the rest of the group. Some have told me that the placemats are ideal for introducing young people to the game. Just a side note: Sometimes experienced bridge players may offer well-meaning advice that may differ somewhat from these beginner lessons. This can be very confusing. Here’s a response you could use: “Thank you for your help. I’m using simple bidding methods for now. Later, I may seek your advice.” These lessons are based on the American Standard Bridge Rules. Bidding methods can be much more complex, precise and sophisticated compared to what I have shown here. My lessons are set up to be as simple and uncomplicated as possible so that beginners have a good, solid platform on which to build. You can stay at this level, following these lessons, and do quite well. You really don’t need much more than this, except what experience will teach you. Bidding is only one part of the game. Playing the hand, assessing the opponents’ bids and what they mean, and remembering the cards as they are played — these are all very important as well, and you can learn those skills by experience and concentration. When you are ready and if you wish, you can always add many more conventions to these basics and/or change your bidding to match your partner’s bidding system, if it differs from yours. Only $10, Click here for a complete description of this guide.